Why I won’t retape other hairdressers/ hair extensionist work. Every week I get emails from all over the world customers saying they are coming to London or they are already living in the U.K, asking me if I can move up their Tape hair extensions that have been applied at another salon. The reason I refuse to do this is for these simple facts please see below. If a cheap or inferior grade of tape hair extensions has been applied to the hair I would never want to put my name to a quality of hair that will not behave properly once applied to the head as this would reflect as bad work to my name. Many tape products and brands have not yet mastered what type of tape should be used to attach the extension hair to the natural hair . Many use tape that is so sticky it is virtually impossible to get out the head and destroys the natural hair on removal. These tape systems that do not use a surgical specific type of tape can leave a big sticky mess in the natural hair which is a disaster to clear out. This can be so time consuming and can take hours. For this reason I will only remove a product which I know comes out the head in a safe manner. Most clients that have hair fitted have no clue what their hair extensionist they have had put it there hair which leaves it a mystery as to what they have in. Tape placement over the head is so important many hair extensionist’s either scrimp on hair or put too much in. If the correct amount of tapes are not used or the tapes are overloaded In the hair, It will never look natural. 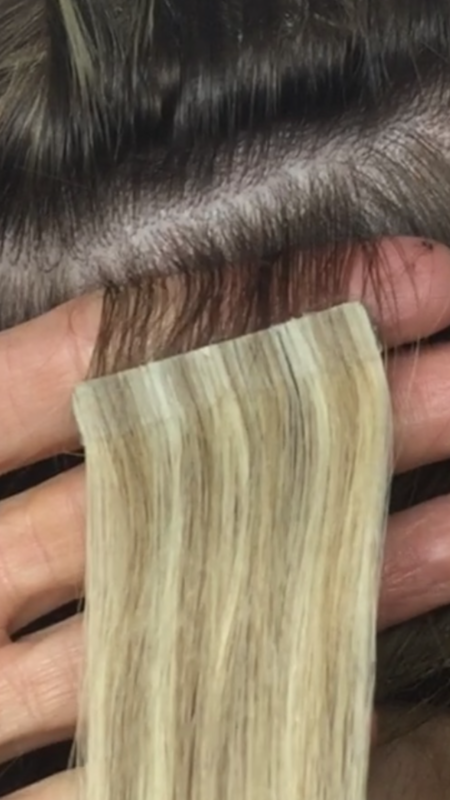 Many hair extensionists actually put the tapes in the wrong position causing bits of the natural hair to poke through and layers not connecting properly. it will never look correct , because the hair will have been cut in most cases it makes it virtually impossible for myself to correct the placement. There will be long and short pieces of taped hair in the wrong position all over the head. This is like trying to piece back together a jigsaw puzzle that was never put together properly in the first place so is a complete disaster. The client will loose a lot of the length of the Extension hair in the correction of bad the application. Sectioning and correct amount of natural hair attached to the tapes. If the section of the natural hair to attach the tapes is not clean or the wrong amount of hair is taken on application, problems happen. When it’s time for removal there will be a lot of damage to the natural hair which I would not want to be responsible for. 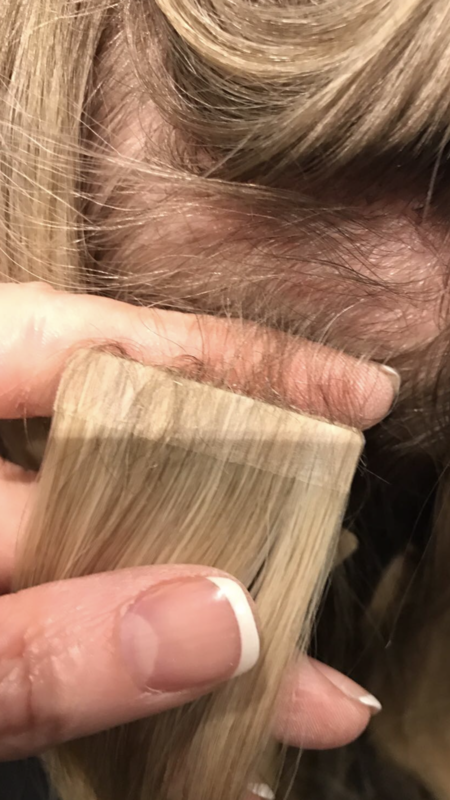 Please see a picture below of a bad application section compared to a good one and how damaging tape hair extensions can be when applied with out the proper skills and knowledge. Cutting is one of the most important parts of the tape hair extension process. This will determine if the hair extensions tapes will look natural or not. if the base of the work is not correct the application and placement it’s like trying to build a house on a bad foundation. The cut will never look good if there is too much or too little hair. If there are big gaps that have been left out the natural hair with no tapes attached. If tapes have been applied to high up the head or not enough at the front part of the head you will never get a natural look. So as you can see there are many different aspects to creating perfectly natural tape hair extensions. What looks okay on the out side could be have a devastating damaging affect on the hair at the attached areas at the root. Do your home work when choosing your hair Extensionist as Professional doing just tapes and not other hair dressing will always be much more experience that someone who is doing hair colour and general cuts. Just Because a hair extensionist is good at bonds don’t mean they will be good at tapes. I always Suggest to my clients to get new hair when they see me for me to be able to do my job precisely and correctly once I have fitted fresh hair you are welcome to come back to me time and time again for a retape. When tape hair Extensions are applied correctly with a good product is used as by a skilled professional who has a lot of experience the tape hair extension system is by far the safest method. It’s the most natural looking as reduces the stringy looks. The hair can be reused and you should not loose any length when they are repositioned correctly when doing a Retape. When all the tapes are positioned in the head properly you can wear you hair up or down without seeing the tapes.